Yesterday was the day to gain courage and enter the largest Dior store in Europe. Concierge opens the door and there we were, at a mini Parisian oasis in the middle of Mayfair. The first feature that stands out is the grand architecture of the space. Designed by Peter Marino, the space is large and includes art pieces by various artists such as Marc Quinn, Tony Gragg and Rado Kirov. It first opened in May, in time of the Dior Cruise runway, I was curious to take a look around and feel the spirit of the brand. There are four floors connected by a gray marble staircase with golden railing. The shop prevails gray with turquoise and pink and white accents. The idea was a store that looked like a Parisian house and so the space features several fireplaces with pictures up on the wall, feeling like a real home. In fact, the scattered books, entice us to have a sit in one of those soft chairs to read or contemplate the Dior House work. I won’t talk about the clothes, otherwise this article would be too long… but I’ll just tell you that it’s everything or more than I had thought. On the first floor, we can have a look at the Dior Homme, the kids line and customize our next perfume. This is a shop that breathes luxury and class, even in simple details like a in-house lady serving tea to customers around the first floor. 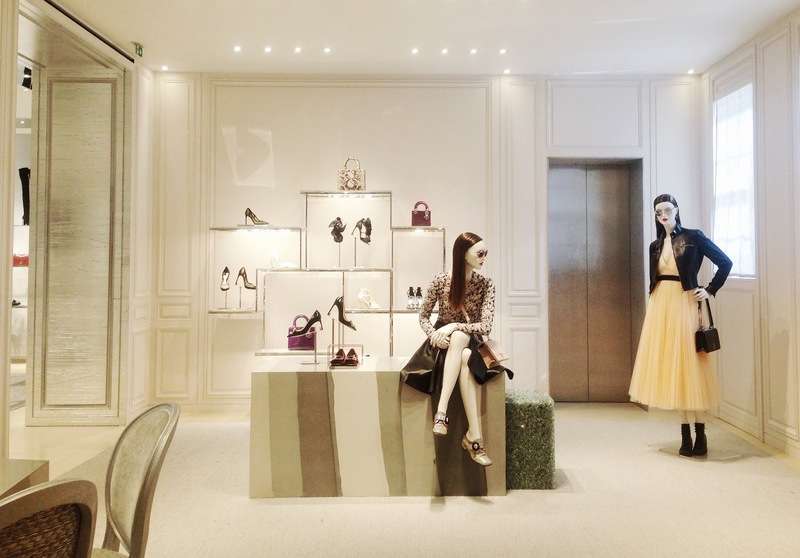 Sidney Toledo, president and chief executive of Dior, on the shop opening, explained that the in-store experience is very important for the brand. In an era marked by the online & buy now shopping, Toledo wants to give customers the opportunity to dream and to be seduced by the brand. I surrendered myself to it. Ontem foi dia de ganhar coragem e entrar na maior loja da Dior da Europa. Porteiro a abrir a porta e lá entramos nós naquele mini oasis parisiense. A primeira característica que salta á vista é a impotente arquitectura do espaço. Projectado por Peter Marino, o espaço é amplo e conta com obras de vários artistas como Marc Quinn, Tony Gragg and Rado Kirov. Abriu em Maio, pela altura do desfile Cruise e eu andava ansiosa para ir lá espreitar. São quatro andares ligados por uma escadaria de mármore cinza com corrimão dourado. Pela loja predomina o cinzento com toques de turquesa, cor-de-rosa e muito branco. A ideia era uma loja que se parecesse com uma casa parisiense e por isso pelo espaço encontramos várias lareiras com fotografias, como se de uma verdadeira casa se tratasse. Na verdade, os livros espalhados, fazem-nos querer sentar num daqueles cadeirões macios a ler ou a contemplar a obra da casa Dior. Nem vos vou falar das peças porque senão este artigo ficaria muito longo, vou apenas dizer-vos que é tudo ou mais do que tinha pensado. No primeiro andar podemos ainda conhecer a linha de casa, a linha de criança e personalizar o odor do nosso próximo perfume. Uma loja que respira luxo e classe, mesmo nos simples pormenores como uma senhora a servir chá aos clientes. Sidney Toledo, presidente e chefe executivo da Dior, aquando da inauguração da loja explicou que a experiência em loja é muito importante para a marca. Numa era marcada pela rapidez do online, Toledo quer dar aos clientes a oportunidade de sonhar e de se deixarem seduzir pela marca. Eu rendi-me. You must be <a href="https://ararapintada.com/wp-login.php?redirect_to=https%3A%2F%2Fararapintada.com%2F2016%2F08%2Fdior-dream-store%2F">logged in</a> to post a comment.